It’s a full time job running a household, children, and other assorted things, which is why mothers (or fathers) could always do with extra help on the side. While mummy blogs and parenting sites make for great online resources, what if you have queries that need answering right now, or that extra helping hand? 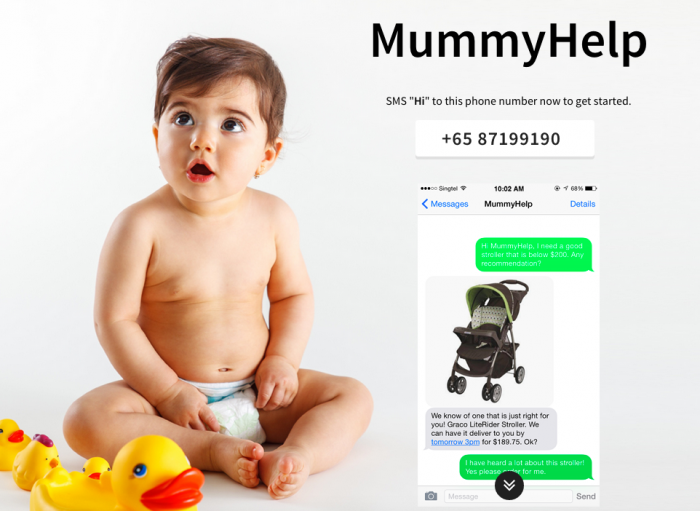 MummyHelp is the SMS-based service all you mothers are seeking in this digital age. 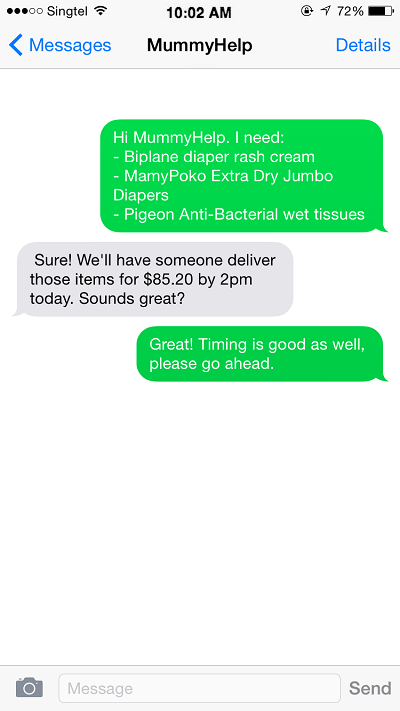 The free service allows you to text your questions — and they will serve as your personal virtual assistant. The website promises help from all areas, including advice, food and grocery deliveries, finding a part-time nanny for your children, and even make restaurant reservations, all instantaneously! Getting help is real easy. To get started, SMS “Hi” to +65 8719 9190 to get started. After that, go on and fill them in with your burning questions or requests about strollers, diapers, and the sorts. And if there’s payment involved, a PayPal invoice will be sent to you accordingly. MummyHelp operates from 9 am to 7 pm daily — a blessing for all the time-strapped mothers out there. Though just recently launched, we can see this service being really popular and useful for young parents and busy mothers in Singapore. With the number of working mothers and families with both spouses working on a rise, when you are a mum, there is going to be a lot more responsibilities to undertake. Still, we think it would be more sensible to keep the lines open 24-7 for general questions and tips for first-time mothers on things like “How do you stop a two-hour hiccup?” or “What do I do when my child can’t stop crying?” — less service-related stuff, but more on tips and advice. After all, a crying baby doesn’t abide by office hours. As long as you keep it legal with your requests, chances are MummyHelp will probably be able to help you out. After all, the mummy needs some mummy-ing sometimes as well, no?